Police are continuing to question six people arrested after an ex-Portsmouth player told a reporter he was involved in fixing football matches. Sam Sodje was secretly filmed by the Sun on Sunday describing how he punched an opponent in a League One game to get a red card in exchange for £70,000. He also said he arranged for another player to be paid £30,000 for getting a yellow card in a Championship match. Portsmouth Football Club said it was “shocked and saddened” by the claims. The six people being held have not been named. 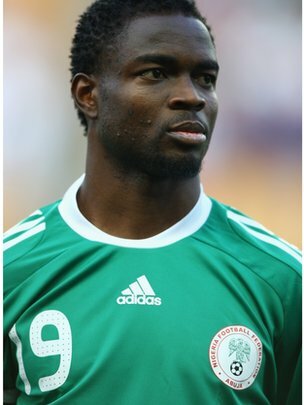 In the video, Mr Sodje also claimed he could rig Premier League games and was prepared to fix matches at next year’s World Cup. In a statement from Portsmouth Football Club, spokesman Colin Farmery said: “If these serious allegations are true then we are extremely shocked and saddened by them, as match-fixing of any type goes to the heart of the integrity of the game. Mr Sodje was sent off in the 50th minute of a League One match while playing for Portsmouth against Oldham Athletic on 23 February. In a game against Oldham last season, Sam Sodje twice lashed out at another player – once in the midriff, and a second time even lower than that. Not surprisingly, he got a red card. Now Sodje has told the Sun on Sunday he was paid £70,000 to get that red card. Today the Portsmouth manager at the time, Guy Whittingham, told the BBC that nobody could fathom out why he did what he did. This is the second football-related investigation being carried out by the National Crime Agency. The first involves Conference football – a much lower level of the game. This is potentially a much more serious investigation involving Championship and League One matches – the second and third tiers of football in England. The Sun on Sunday also reported that an Oldham player, Cristian Montano, apologised to Mr Sodje after failing to get a yellow card in the first half of a match against Wolves on 22 October. And it reported that Mr Sodje’s brother Akpo, a striker at Tranmere Rovers, had said he would be prepared to be paid to be booked. Oldham Athletic said in a statement: “Oldham Athletic Football Club has been made aware of the incident and allegation surrounding one of its players, Cristian Montano. The club will commence an immediate internal investigation to establish all the relevant facts of the case. The National Crime Agency, which is investigating the claims, said: “We can confirm that the Sun on Sunday has passed material from its own investigation to the NCA. The Football League said it took claims of criminal activity “extremely seriously” and would assist police. Football League chief executive Shaun Harvey encouraged anyone with any evidence to report it to the police. The Gambling Commission and the Football Association both said they were aware of the investigation and were working with the NCA. The Professional Footballers’ Association said in a statement: “The PFA is aware of the reports in today’s media regarding allegations of ‘match fixing’ and other related activity. “These allegations, if proven, unfortunately demonstrate the real issue football faces in terms of corruption and highlights the necessity of the work carried out by the PFA and other stakeholders in the game in educating players of these risks. In a separate NCA investigation into an alleged international betting syndicate, two non-league footballers were earlier this week charged with conspiracy to defraud. Michael Boateng and Hakeem Adelakun, both 22, play for Whitehawk FC, based in Brighton, in the Conference South. Two other men, Singapore national Chann Sankaran, 33, and Krishna Sanjey Ganeshan, 43, who has dual UK and Singapore nationality, were charged with conspiracy to defraud in November. The pair have been bailed and are due to appear at Birmingham Magistrates’ Court on 11 December.